Since its introduction in 2001, the 300 Winchester Short Magnum (300 WSM), has proven very popular for hunting and long-range competition. The case has ample capacity to drive the heavy 30-caliber bullets, and with proper case prep and annealing, the WSM is capable of outstanding accuracy. When Nebraskan Greg Anderson decided to build his "ultimate long-range hunter", he selected the 300 WSM for its accuracy and its ability to drop large game at long distances. 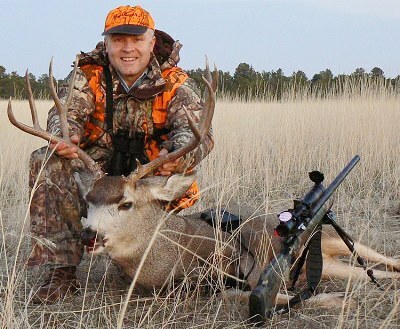 Teaming up with Chris Matthews of LongShot Rifles, Greg developed a superlative long-range hunting rig, with high-tech components to reduce weight. The 26" barrel is a carbon-wrapped composite over a Rock Creek stainless blank. The carbon technology saved about 3 pounds over an all-steel barrel of similar length/contour. The Manners Composite stock also features carbon fiber construction for stiffness and reduced weight. 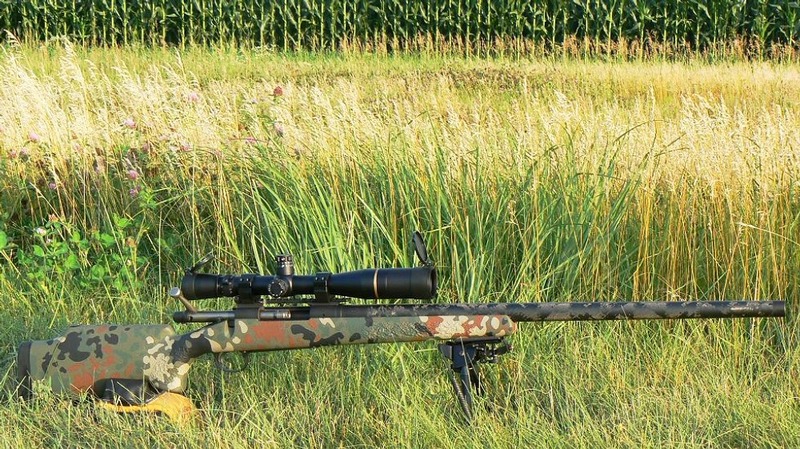 Greg's carbon/carbon rifle tips the scales at just 10.8 pounds, including scope and bipod. A conventional rig could easily weigh 15 pounds or more. Greg's carbon hunter has proven accurate as well as innovative. 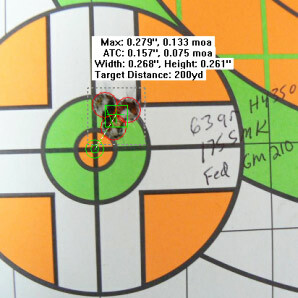 With 175gr Sierra MKs, the gun shoots well under 1/2-MOA out to 600 yards and beyond. The purpose of this project was to create a hunting rifle that would be inherently accurate at long range and have an acceptable weight for hunting in rough country. Being somewhat familiar with the long range rifle market, I noticed that most of the guys were putting # 7 contour barrels on their rigs. But these same shooters would also comment about how heavy their rifles were to carry when hunting. I researched the question of overall weight with several gunsmiths. The smiths confirmed that while fat-contour barrels could deliver improved accuracy, there was a price to pay & a lot more weight. With a heavy barrel, the finished rifle would be most likely weigh about 15 pounds. That's more than I wanted to haul around in the field. To reduce barrel weight, the suggested "traditional" solutions were fluting, which would reduce barrel weight by at least one-half pound, or going with a smaller diameter barrel. Fluting didn't promise enough weight savings, and a slim, sporter barrel probably wasn't going to deliver the kind of consistent accuracy I wanted (particularly as the barrel heated up). Accordingly, I decided to "think outside the box". My research on lightweight barrel options lead me to Advanced Barrel Systems, (ABS) a company in Lincoln, Nebraska that produces custom carbon-wrapped barrels. ABS has its own patented carbon-wrapping process which is different (and more sophisticated) than methods used by other barrel-makers to carbon-wrap their tubes. A phone conversation with ABS President Mike Degerness revealed just how adaptable ABS's patented barrel-wrapping technology could be. Mike can wrap a barrel to virtually any shape and diameter, allowing great stiffness even with a huge reduction in barrel weight. As the "core" for his carbon-wrapped barrels, Mike recommends a cut-rifled blank made by any of the quality cut-barrel makers. Using such blanks, Mike has successfully produced quality wrapped barrels in just about every caliber, length and configuration. You can learn more at Mike's website, www.carbonbarrels.com. One interesting benefit of ABS-style barrel wrapping is that the carbon components have a vibration-dampening effect. According to ABS, the extreme rigidity of the finished composite barrel dampens the vibration nodes of the barrel making it shoot like a plain steel barrel of much greater mass. Carbon fiber has a high modulus of elasticity that has the effect of lowering the amplitude of the vibration of the barrel when fired. This is what makes the ABS barrels perform so well, according to Mike. 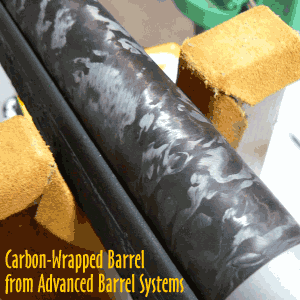 In the TECH SECTION below, we explain some of the science of carbon-wrapped barrels. Some of you may be thinking: "I'm no physics major, just tell me how much weight I can save!" OK, here's the bottom line: a 24-inch, # 7 contour ABS carbon-wrapped barrel will weigh about 2.5 pounds compared to about 5.5 pounds for a steel barrel of the same length and contour. So, this means that you can put a fat, stiff competition-contour barrel on your hunting rifle and save over half the barrel weight compared to an all-steel barrel. Saving three pounds is a blessing when you're carrying the rifle all day long in the field. Convinced of the benefits of the ABS system, I placed an order for a 30-caliber Rock Creek barrel blank with an 1:11.25" twist and a finished length of 26". Mike wrapped the barrel and finished ground it to an M24 contour. The surface finish of ground carbon fiber has a distinctive, multi-color swirl pattern that adds an exotic look to the finished rifle. To smith the rifle, I selected Chris Matthews of LongShot Rifles, LLC because of his expertise with the WSM cartridges and long-range shooting equipment. Chris has lots of experience with short magnums and a great reputation for building super-accurate long-range rigs. Because cost was a factor for the project, we decided to use a donor Remington long action that had been used on a Remington 7mm magnum. Chris trued the action and we had Dave Kiff from Pacific Tool & Gauge grind us a bolt to fit the action more perfectly. Chris chambered the Rock/ABS barrel and installed a .300 Badger recoil lug. Being a fan of carbon fiber technology and knowing that Tom Manners can deliver a stock with minimal lead-time, I selected an MCS-T stock from Manners Composite Stocks. These stocks have an extremely high strength-to-weight ratio and the high comb of the MCS-T gave an almost perfect alignment with the scope. The finished rifle was topped off with a Leupold 4.5-14x40mm LR scope equipped with M1 windage and elevation turrets. A Harris bipod completed the package. All up, including scope, steel rings, and bipod, my 300 WSM rifle with 26" barrel weighs 10.8 pounds. To put things in perspective, that's just a few ounces more than a Light Varmint PPC with an aluminum Panda action, aluminum rings, and 21.5" barrel. Utilizing the bipod, I developed a load using 63.0 grains of H4350, 175gr Sierra Match Kings with Federal 210M primers in Winchester-brand brass. This load gives 2960 FPS out of my rifle. 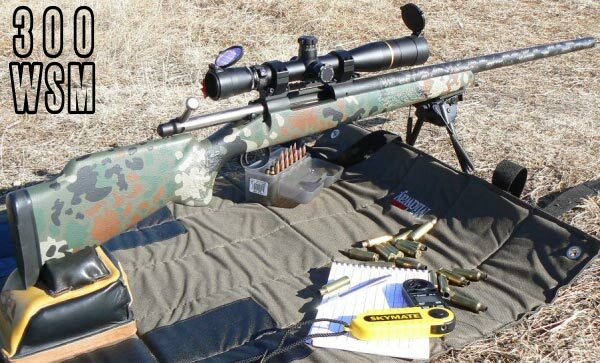 The load would shoot sub-MOA from bipod from 100 yards to 600 yards and was adopted as the go to load as preparations were finalized for the up-coming 2008 hunting season. I have also tried the 208gr Hornady A-Max in this gun. The A-Maxs shot well but the Sierras work well for everything (paper punching and hunting) so the 175gr SMK is my bullet of choice. 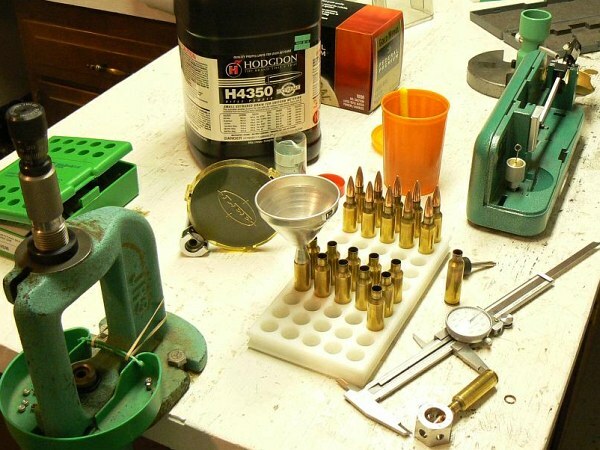 The Winchester-brand brass is good, but you have to prep it throroughly if you want good results. My brass preparation consisted of turning the necks, de-burring the flash holes (inside and out), and chamfering the case necks. Using a Sinclair neck-turning tool, I turn the necks to .0135" per side. That provides a complete clean-up of the necks, which run about .015" neck-wall thickness out of the box. One thing I've learned to do is anneal the brass every 3-4 firings. I started to do that after I noticed that the force required to seat bullets became inconsistent after just a few loading cycles. I also experienced flyers that were going out of the group for no apparent reason. Annealing the cases every 3-4 firings has eliminated most of the unexplained flyers and annealing has also made bullet seating much, much more consistent. I've also noticed a significant improvement in my groups at 500 and 600 yards now that I anneal regularly. Group sizes at 600 yards can be as much as 2" smaller with annealed brass than with un-annealed, work-hardened brass. My annealing method is pretty simple. I brush the inside of the necks so they are clean. 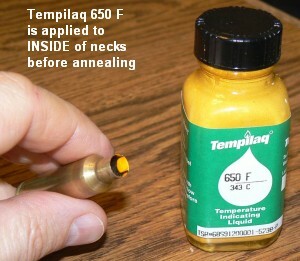 Then I apply Tempilaq 650° F temp-sensitive liquid to the INSIDE of the necks. I spin the cases through a torch flame until the Tempilaq melts. Then I set the annealed case on a wire rack to cool. I do NOT use a water quench after annealing. I read on this site that it was not necessary, and that proved 100% correct. If you maintain the correct temperature range during annealing, you don't need a bucket of water. Looking at the targets below, one may ask, "Does the rifle always shoot this well?" The answer, not suprisingly, is: "it depends on the trigger-puller". The rifle is capable of outstanding accuracy. But it took some time and effort for me to develop the skills required to shoot up to the rifle's inherent accuracy. I nearly always practice prone from bipod. Initially, I was getting horizontal stringing until I changed my grip and learned to be more consistent from shot to shot. Shooting a heavy-recoiling 30-caliber rifle from the ground is not the same as shooting a .223 Rem from the bench. Learning to shoot well at longer range was more difficult than I thought. While this rifle is easily the most accurate that I have, shooting good groups at 500-600 yards took some refining of the skill set and listening to those who have done it before. These groups represent what I learned to do, and show the accuracy the rifle can produce on a consistent basis. When developing my set points on my scope for different yardages, there were numerous times that I would have a 3-shot group under 2" at ranges beyond 500 yards. I generally shoot 3-shot groups to save wear and tear on my barrel to make it last as long as I can. After all, it is a hunting rifle. Speaking of barrel wear, I now have about 650 rounds through the barrel (I practice with it regularly), and I recently bore-scoped it. To my surprise, there was almost no throat erosion, and the bore looked almost new. That explains why I haven't had to "chase the lands" so far. I do shoot a fairly "mild" load, and that may explain the minimal wear. But whatever the reason, I have no doubt that I will get many thousands of useful rounds out of this ABS barrel before it is replaced. Last November (in 2008), I took the 300 WSM out for its first hunt. This was on some private land here in Nebraska. In the morning I had noticed some Mulies feeding in a Canyon. I figured later in the day the wind would be right and the group of animals would be moving up out of the canyon near dusk. Sure enough, at about 5:00 pm, just as the sun was going down, the first Mulies started to come up out of the canyon. I was in position a few hundred yards away and downwind. As daylight faded, there were 8-10 deer total, filtering up out of the Canyon. There were a couple of bucks, but one looked to be the best of the lot. He lifted his head and I could see a nice spread, but I wanted to check his forks. I waited about 10 minutes and then he turned to give me a good shot. I ranged him with my Leica LRF 1200 rangefinder. The buck gave me a broadside shot ranged at 364 yards. I settled behind the scope and took one shot. It hit right where I aimed and the buck just folded. That was a great feeling... all the work that Chris and I had put into the rifle paid off. "Many old-technology composite barrels rely on tensioning a composite sleeve over a tiny barrel liner. There are flaws in this approach. When steel is heated, it expands; carbon shrinks when heated. Any heat changes the amount of tension in the barrel and as a result the harmonics change too. Our patented method of tuning the barrels by manipulating the helix angle of the fiber placement isn't heat sensitive." With old-fashioned carbon-sleeved barrels there was a problem because the carbon acts as an insulator, interfering with the transfer of heat away from the steel core. 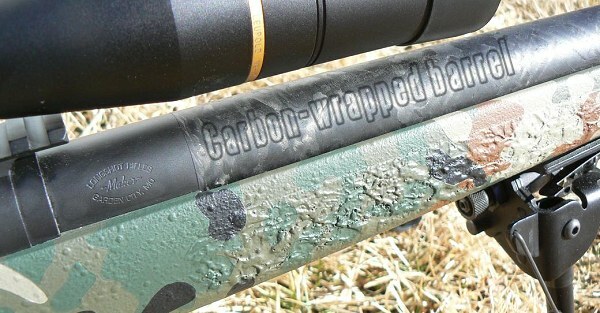 The old-school carbon barrel sleeves perform poorly because they are made with polyacrylonitrile (PAN) fibers. With PAN fibers, heat tends to follow the fibers and will not cross from fiber to fiber. 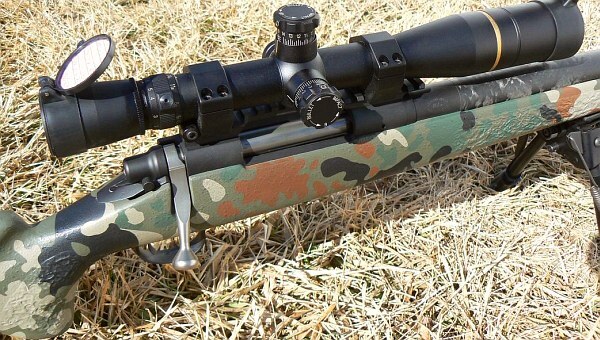 Depending on the type of steel used, common rifle barrels have a thermal conductivity around 20 W/mxK, while a wrap using straight PAN fibers has a thermal transfer coefficient of around 19 W/mxK. This similarity in thermal transfer rates does very little to dissipate the heat of the steel core. This is the underlying reason for the poor performance of many of the early attempts to apply carbon-wrap technology to rifle barrel. Heat would not escape easily through the carbon sleeve, so the steel barrel core didn't cool adequately. To overcome this material problem (poor heat dissipation away from steel barrel core), ABS developed a matrix of materials that includes chopped pitch fibers similar to those used in the brake pads for racing cars. This matrix, combined with an epoxy that can withstand 500? F, provides an extremely ridged structure with a thermal transfer coefficient approaching 700 W/mxK -- 35 times higher than that of "old-fashioned" PAN-fiber carbon sleeves. So what does that mean for the shooter? Quite simply, ABS has figured out a way to make their carbon-wrapped barrels cool faster than first-generation carbon-sleeved barrels. In fact, the ABS barrels cool up to 300% faster than all-steel barrels. 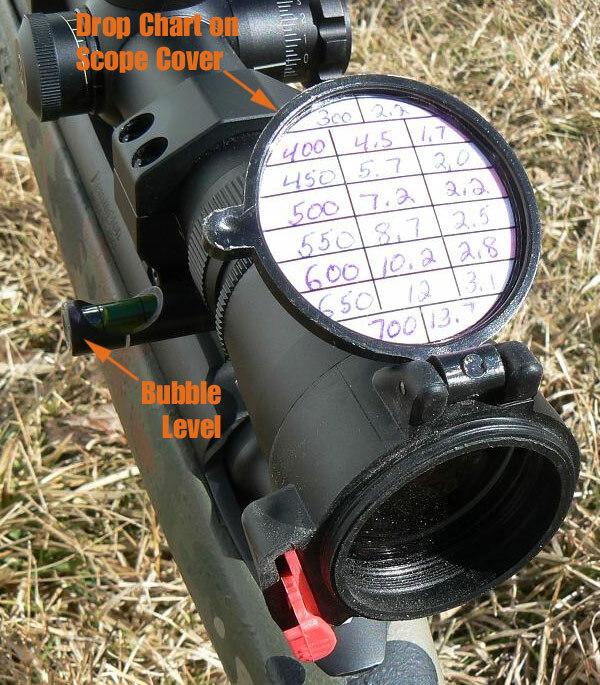 Thermal tests conducted at the University of Nebraska College of Engineering showed that an ABS carbon-wrapped barrel will cool much faster than a steel rifle barrel of matching profile. Mike explains: "We recognize that heat management is a critical element of building a better barrel. 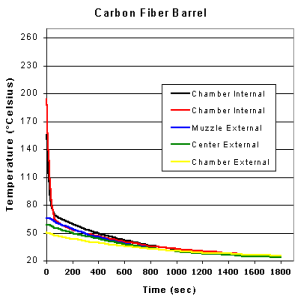 Carbon composite barrels built with ordinary fiber grades have a reputation of insulating heat. We use a patented method of applying a thermally conductive matrix that conducts heat 372% faster than steel." If you look at the charts at right (from the Univ. of Nebraska lab tests), you can see that the ABS carbon barrel actually sheds height faster than an all-steel barrel. Also notice that, on the ABS carbon barrel, the muzzle stays cooler than the chamber. 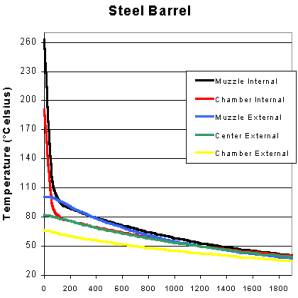 By contrast, on the all-steel barrel, when the chambered reached 190° C, the muzzle reached 262° C! That all-steel barrel got very hot at the end, something that can degrade accuracy. VV N550 73.0 Fed 215 Mag 110gr Horn VMax n/a With 15-twist bbl chambered for short bullets, ultra-accurate, hell on ground hogs. RL 17 68.0 Fed 215 Mag 168 Barnes TSX tipped 3280 Accuracy excellent. Single-digit ES betw. 68.0 and 69.0 grains. IMR 7828 69.5 CCI LR Mag 168gr Barnes TSX 3000 Win Nickel brass. Jump .060", 3/4 MOA. Very effective Deer/Elk Load. RL 15 59.0 Fed 210 168gr Berger VLD 3105 Vel in 24" bbl. Hunting load--hammers deer. VV N560 70.0 WLR 175gr Berger VLD 3190 1/2 MOA or less in 28" Krieger 12-twist barrel. Just touching lands. 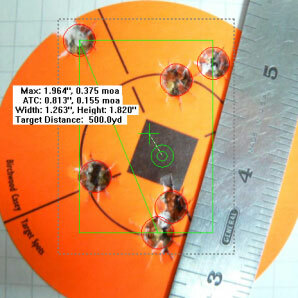 H4350 63.0 Fed 210M 175gr Sierra MK 2960 Greg Anderson hunting load. Win Brass. Very Accurate in 11-twist, carbon-wrapped 26" bbl. H4350 63.0 Wolf LR 180gr Barnes Triple Shock 2975 Win Brass. Hunting load for Savage 16. Serious Recoil. RL 22 70.0 Win LR Mag 180gr Barnes Triple Shock 3025 Elk load. ES of 16. Great hunting bullet. 1.2" group at 100 in factory m70. Win 760 66.0 Fed 215 Mag 180gr Nosler Accubond 3030 Hunting load seated off lands. 3/4 MOA at 100. H4831sc 68.0 Fed 210M 180gr Nosler Accubond n/a Win Brass. 2.86" COAL. Half-MOA, 3-shots, almost no vertical in Savage sporter. H4831sc 64.0 CCI BR2 210 Berger VLD 2850 Long-range BR load in Norma brass. Very accurate in 10-tw Krieger. Norma seems better than Win brass. H4350 60.0 CCI BR2 210 Berger or 210 SMK 2855 Long-range BR load in Norma brass--has won many WmPort matches. Very low ES. Vel in 30" bbl. Fed 210M works also. VV N165 64.0 CCI BR2 210 Berger or 210 JLK 2850 Long-range BR load. Norma brass. Very accurate, 1/4 MOA at 200 yards. Also try N160, 61.0 grains. WARNING: With all loads, ALWAYS START 10% LOW and work up incrementally. You should begin with conservative, published loads from manufacturers, found on sites such as the Hodgdon Reloading Data Center. NOTE: Loads in the above table are provided by Forum members and shoot well in their respective rifles. However, you should treat these all as "MAXIMUM" pressure loads and work up from smaller charge weights. Topics: Precision rifle, hunting, 1000-yard, 1000 Yards, 300 WSM, .308, 30 caliber, Win Mag, Winchester Short Mag, LongShot Rifles, carbon stock, Carbon barrel, Carbon-wrapped barrel, Advanced Barrel Systems, elk, antelope, hunting, long-range, rifle shooting, rifle accuracy, mule deer, deer hunting, Hodgdon, H4350, IMR 4064, Tom Manners, Manners Composite stocks, MCS-T stock, Carbon Fiber, Remington, actions, Rock barrel, Rock Creek, reloading, powder selection, Winchester Brass, Lapua Brass, Badger Ordnance, Hornady bullets, Sierra bullets, 175 Match-King, Leupold, Harris bipod." Photos and text Copyright ? 2009 Greg Anderson and AccurateShooter.com, All Rights Reserved. No reproduction of any content without advanced permission in writing.